Invoice numbers are created in MoneyWorks from the Abtrac import file. Credit notes are created when an invoice total is a negative number. Invoice numbers in Abtrac must be 11 digits or less to import to MoneyWorks. Abtrac exports to MoneyWorks Service invoice types only. Clients and Jobs must exist in Abtrac before an import occurs. But they do not need to exist in MoneyWorks before an import. During the import MoneyWorks will automatically create customers and jobs from the import if they do not already exist. Invoice imported from Abtrac are set as ‘Unposted’ and will still need to be reviewed and ‘Posted’ in MoneyWorks. 1. Abtrac exports ‘Client Name’ and ‘Job Number’ not ‘Name on Invoice’ from Abtrac. 2. Client address details are not included in the MoneyWorks transaction import. 3. Invoice Terms are taken from the Client Debtor details in MoneyWorks, but the invoice due date is specified from the Abtrac import file. 5. Purchase Order Number, Progress Claim Number and Client Job Number from Abtrac are imported as User1, User2 and User3 fields in MoneyWorks. 6. If you wish to track jobs in MoneyWorks: The job will be created from the import file if the job does not exist in MoneyWorks – but only the job number is created. You will still need to assign the job to a client and enter all other details in MoneyWorks if required. GL Numbers need to be set in Abtrac and must match exactly with MoneyWorks Account Codes before your import occurs. Tax Codes will also need to be specified for each MoneyWorks integration. 3. Account Numbers and GST Codes from MoneyWorks. Please supply Abtrac with copies of your Tax Codes. This information can be retrieved from MoneyWorks> Show > Tax Rates. If you use Departments details of these codes (GL Account suffixes) and how/when they are applied must also be specified. Any subsequent additions to these GL Codes will automatically apply to future uploads. 4. Once Abtrac has received your accounting information, and discussed any ‘special cases’ that may apply to your business (including confirming whether you require a single or multiple line export); we will create a test file to import into MoneyWorks. At this time if required we will also create an Abtrac Invoice Map – to store in your MoneyWorks Import Maps folder. 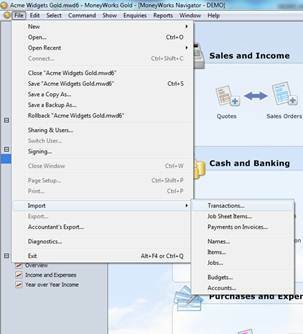 Export the file to your specified location and then open MoneyWorks to import invoices. 7. Browse to find the Abtrac Upload File and choose Open. Check Invoice Numbers, Create Names, Create Jobs. Choose ‘Transactions are split’ for Multiple Line invoices – the Key field is ‘OurRef’. MoneyWorks will analyse the import file and report on any errors/warnings, before giving the option to Import the transactions. Any lines with errors will not be imported. 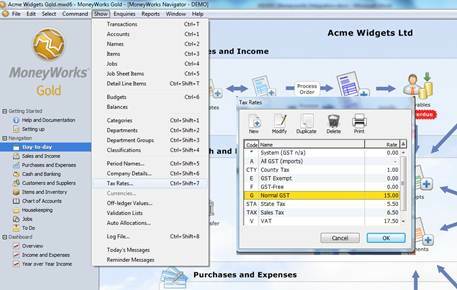 That the Tax Code or Account Code specified from Abtrac does not exist in MoneyWorks (or vice versa). If you’ve chosen not to Create Names or Jobs you may also get errors if Client or Job details do not match or exist in MoneyWorks. The Accounting Period must exist in MoneyWorks to import an invoice to. 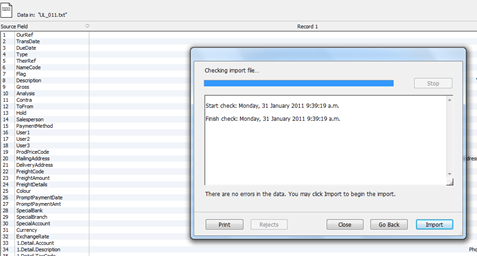 The MoneyWorks import check will specify which lines in the import file are causing problems. This entry was posted in Accounting Package Integration and tagged accounting, accounting package, debtor upload, moneyworks by Jen. Bookmark the permalink.